Join Dayle over at A Collection of This and That for a link up party! 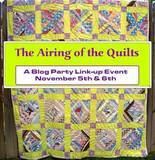 November 5-6 Dayle is hosting "The Airing of the Quilts". Stop on over at her blog and join in the fun!